Least Sandpiper - 7 at Caldwell Road, Northfield, 1 at Satan's Kingdom. Pectoral Sandpiper - 1 at Turner's Falls Airfield. Semi-palmated Sandpiper - 3 at Satan's Kingdom. Solitary Sandpiper - 1 at Satan's Kingdom. In addition, small numbers of Killdeer at Caldwell Road, Satan's Kingdom and Turner's Falls Airfield and a Spotted Sandpiper at Satan's Kingdom were most likely local breeding birds. A Grasshopper Sparrow was singing out on the airfield at Turner's Falls with American Kestrels present there and at Caldwell Road, Northfield. Indeed, the only disappointing site was Four Star Farms in Northfield which appeared to be completely devoid of shorebirds of any kind. Great Blue Herons - Barton Cove, Gill, Franklin Co., MA. July 23rd, 2018. Towards the end of the evening I was intrigued to see and hear two Great Blue Herons moving north high over Barton Cove, Gill. 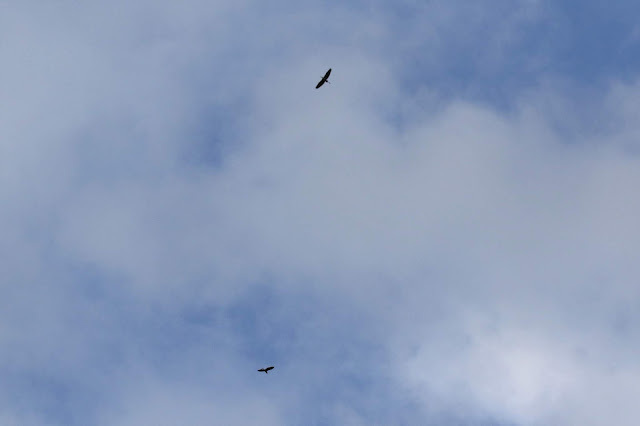 The birds spent about three minutes circling high overhead before continuing north. I couldn't help but wonder why north? Post breeding dispersal perhaps?